Didn’t the 9 days just fly by? Aren’t you feeling better already? I sure am; it feels great! We must remember NOT to skip meals, and stick to the eating schedule we have set up for ourselves in Phase One. We must keep up the good work with physical activities, to keep on smashing the fat, and building good habits. Coffee – 1 10oz cup, and 3 cups or herbal tea, and 5 cups of Club soda or 2 cans of diet soda, and 1 cup of iced tea (sweetened only with 2 packets of sugar substitute, or Lemonade made with real lemons and 2 packets of sugar substitute or 2 tsp of granulated sugar. TIP: Don’t forget to do some physical activity after dinner. Also, remember your food portion size: less is more! Whenever you weigh yourself, do it in the morning just before stepping into the shower. You will love your scale. 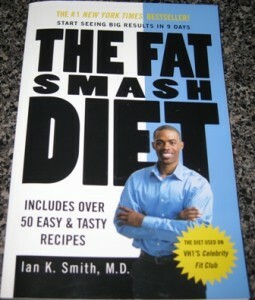 Started the Fat Smash diet on August 1st. My start weight was 210.6. I weighed in on August 12th at 199.4. I am on phase 2 now and added meat but I gained a pound back. I think I might go down to phase 1 again until I get to the mid to low 190s. I am doing about 40 minutes on the treadmill in the morning and taking evening walks with my family for exercise. You are doing great. Keep up your diligence through all the phases…..watch your food portions….drink water on regular basis…it cleans your system out and keeps you felling full. Don’t worry about one pound…could be retained water from salt in the meat preparation.